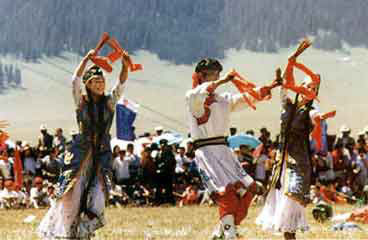 Wide spread in Erdos, Inner Mongolia, the Chopsticks Dance is often seen on festive or celebrative feasts with only one man as the dancer. Holding a bunch of chopsticks in one hand or two hands, the dancer remains on the same spot, shaking his shoulders quickly, along with the bending and stretching of legs and rocking of body. In a relaxed and smooth manner, the dancer clapping his own hands, shoulders, waist and legs, etc. by chopsticks and then proceeds in a circle or goes forward and backward in a straight line. 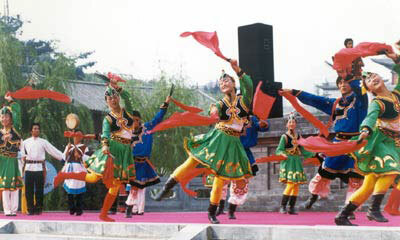 The dance's posture and movements are unrestrained and nimble; the ways of clapping chopsticks are flexible and varied. Reaching the climax, the dancer will be shouting while he is dancing to add to the fun.